Today’s subject is a popular fruit that seems sweet and juicy to us, but turns into a deadly assassin when it sees a cancer cell. Research show it slows down the growth of breast cancer cells and their ability to spread. It contains polyphenols, which can be a helpful addition to current chemotherapy methods to reduce the risk of metastasis, the primary killer in breast and many other cancers. In Hungary, this juicy fruit is known as “the fruit of calmness,” and in China, it’s a symbol of good luck and longevity. It rightfully earned these names because of the health benefits it packs inside. The fruit I’m talking about is our fuzzy, fist-sized friend, the peach. Officially known as Prunus persica, it earned this scientific name from the journey it took from its original location in China, through Persia, to Europe by way of the Silk Road. Peach cultivation is recorded in ancient Chinese records dating back as far as 1100 B.C. But they weren’t introduced to the Americas until the 1500s, when Spanish settlers brought them over. Peaches are a member of the stone fruit family because they have one large seed in the middle. There are two different categories: clingstone and freestone, depending on whether the flesh sticks to the inner seed or whether it easily comes apart. No matter which variety you prefer, both are deliciously promising to your health. A study performed by scientists from AgriLife Research at Texas A&M University identified two phenolic compounds, choloregenic acid and neochlorgenic acid, both found in high levels in peaches. As a result, the researchers concluded the peach’s phenolic components have the potential to be used as chemopreventative agents. In this investigation, the scientists implanted breast cancer cells beneath the skin of mice, a technique called xenograft. After only 12 days, the researchers observed the mice fed with high levels of polyphenols had reduced tumor growth and also showed evidence of less cancer spreading to other parts of the body. The report suggests the peach compounds may turn into a new chemopreventative tool (i.e. a substance that interferes with the development of cancer). They reduce the risk of metastasis in combination with current therapies when primary cancer is diagnosed. According to the doses given to the mice, when scaled up to a 132-pound person, two to three peaches a day or a dietary supplement of peach polyphenol extract powder would supply the needed compounds. 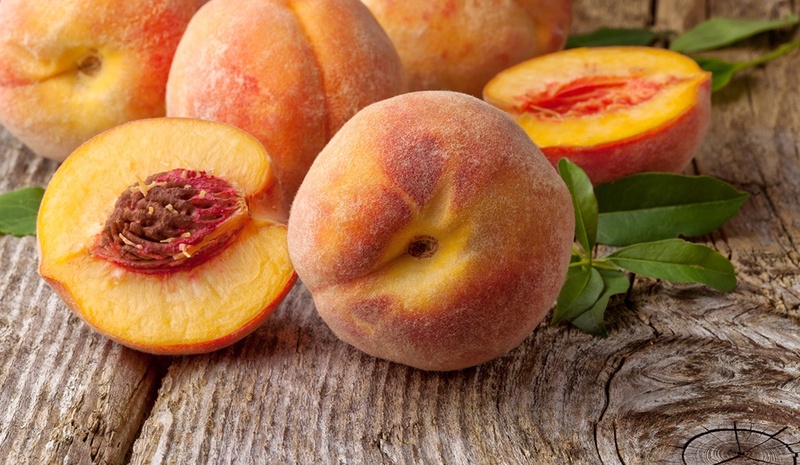 They discovered the women who ate more peaches experienced a lower risk of ER- tumors among postmenopausal women. This is a correlation – it’s not proof that one thing caused the other. But it suggests that it might have. The researchers treated several lab-cultured colon cancer cell lines with peach polyphenols. They found the compounds dramatically reduced cancer cell development and growth. Peach nutrition also offers help when used in combination with cisplatin, one of the most effective chemotherapy drugs prescribed to fight a variety of tumors. However, cisplatin’s clinical use is limited because it’s a deadly poison that can damage internal organs. As my longtime readers know, I’m not a fan of chemotherapy, but I’m also aware that many people feel they MUST do what their doctors tell them. And I also know that chemo sometimes works against early stage cancers. So I try to look for natural remedies that can be used with chemo and are known to make the conventional treatment more effective. This study demonstrates supplementation with PPFE might protect against cisplatin-induced toxicity in cancer patients. This report also points out using PPFE by itself slowed the growth of the colon cancer cells. And when given in combination with cisplatin, it increased the drug’s tumor-destroying effect. Locally grown peaches in season are one of my favorite fruits. They’re the ultimate treat. But the typical peaches sold in supermarkets are unfit to eat, in my opinion, even in season. There’s also a problem in that conventionally grown peaches tend to be heavily sprayed with pesticide, no matter where they’re grown or what time of year it is. An organic farmer in my area told me that organic peaches are hard to grow because they’re very susceptible to diseases. I see few organic peaches in farmers’ markets or anywhere else, so I’m inclined to believe him. The ones I do see are not very good. In a farmer’s market you may find a lot of “low-spray” peaches, but probably few that can honestly claim to be “no-spray.” “Low-spray” doesn’t have any official definition – it’s just the farmer’s opinion that he or she used as little spray as they could. To help reduce any pesticide residue that’s still lingering on the peach skin, be sure to wash them before eating. If your peaches aren’t quite ripe enough, you can place them in a paper bag or near a windowsill. It’s best to buy them firm and let them get soft. They do that fast, don’t worry. The two most common varieties, freestone and clingstone, both contain the same nutritional values. They are an excellent source of vitamin C along with vitamin A, potassium, magnesium and iron. Yellow freestone peaches are by far my favorite. Call me prejudiced, but I don’t bother with white peaches and I seldom buy any clingstones. Yellow freestones are soft and squishy at the peak of ripeness. I can see why you don’t find them in supermarkets. They’re a shipper’s nightmare. When buying canned peaches (my opinion: yeech! ), be aware they’ve probably lost a great deal of their nutrients, and avoid those in heavy syrup and added sugars. Peaches are naturally among the sweetest fruits. They do NOT need more sugar. The best choice for off-season peaches is to can or freeze them yourself, even if it reduces their nutritional value; it’s better than not eating them at all. Haven’t tried freezing them – I can’t say how that will go. Identifying peach and plum polyphenols with chemopreventive potential against estrogen-independent breast cancer cells. Peaches, plums induce deliciously promising death of breast cancer cells. Polyphenolics from peach (Prunus persica var. Rich Lady) inhibit tumor growth and metastasis of MDA-MB-435 breast cancer cells in vivo. Research: Peach extract slows breast cancer growth, spread. Intake of specific fruits and vegetables in relation to risk of estrogen receptor-negative breast cancer among postmenopausal women. Polyphenols of selected peach and plum genotypes reduce cell viability and inhibit proliferation of breast cancer cells while not affecting normal cells. Inhibition of growth and induction of differentiation of colon cancer cells by peach and plum phenolic compounds. The extract of Prunus persica flesh (PPFE) attenuates chemotherapy-induced hepatotoxicity in mice. Extract of Prunus persica flesh (PPFE) improves chemotherapeutic efficacy and protects against nephrotoxicity in cisplatin-treated mice.